As school ends and people start looking for things to do with the family, many farmers decide that this is a great time to open up their farm to the public. Some have a simple open farm day where people can tour the farm and buy farm fresh products while others do things like goat yoga classes. It seems like a great way to earn a few extra bucks, but are you putting yourself at risk? 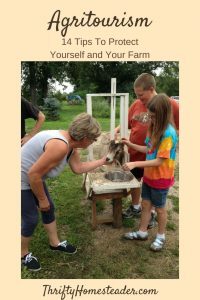 We have certainly done our fair share of farm events — from a “farm crawl” that we did in cooperation with four other local farms for five years, to on-farm classes on homesteading skills, such as raising goats. We thought about liability issues, but mostly those thoughts centered on making sure that there were no trip hazards and that our livestock guardian dogs were locked up. Then last year at the ADGA conference, I attended a session presented by Dr. Megin Nichols, DVM, MPH, DACVPM, who works as the Enteric Zoonoses Lead in the Outbreak Response and Prevention Branch of the Center for Disease Control. She told us about an E. coli outbreak at a goat farm in Connecticut that hosted an open farm day. As it turns out, there was E. coli in the goat poop. She said that even routine testing may not have prevented the outbreak because animals may shed pathogens intermittently. You could get a negative test, and a couple of days later, they could be shedding something. And there is no clear answer about what to do with an animal that tests positive. Treating them does not necessarily guarantee that there will be no more pathogens in their system. It can also prolong shedding and lead to antimicrobial resistance. This particular story had a really sad ending. Even though more than 40 people were sickened and 10 hospitalized, no one had become ill from consuming the farm’s products. It was simply from being in contact with the goats. Unfortunately, once the story became public, their cheese and soap sales plummeted to nothing, and they went bankrupt. Although the dairy owners said they did not allow anyone to go into the goats’ pens, the CDC found pictures posted on Facebook of people in the pens, including one child that was laying down in the straw! We heard another story about a school that rented a space for an event, and that space had been used for a dairy cattle event two weeks earlier. The grass was contaminated from the cow poop, even though you couldn’t see it any longer, and several children wound up with kidney failure and were put on dialysis. How can you protect your farm? Dr. Nichols said that many farms that wind up with a disease outbreak are not those that have agritourism as their main business. They are simply farms that decided to open up for a day or a weekend to make a few extra dollars. Such farms are at particularly high risk because they don’t consider all of the possible problems that can arise when the public is visiting the farm. They don’t have hand-washing stations, signage, or staff to watch everyone. Dr. Nichols provided the following list as a starting point for the things you need to consider before opening up your farm to the public. Although none of these may help in the court of public opinion if there is a big disease outbreak, they may help you if you have to defend yourself against a lawsuit. What about hand sanitizers? They are better than nothing, if you don’t have hand-washing stations, but they don’t kill cryptosporidium. I also found it interesting that in the Connecticut outbreak, there was no difference between those who did or did not use hand sanitizer and who became ill. In other words, the use of hand sanitizer did not seem to protect anyone. Many people have asked when we are going to start doing goat yoga. I have goats, and I do yoga, but the answer is never. I used to be worried about liability in case a goat caused someone to lose their balance and fall and break an arm. But there is also the very real risk that goats will be pooping on people’s yoga mats. Need I say more? 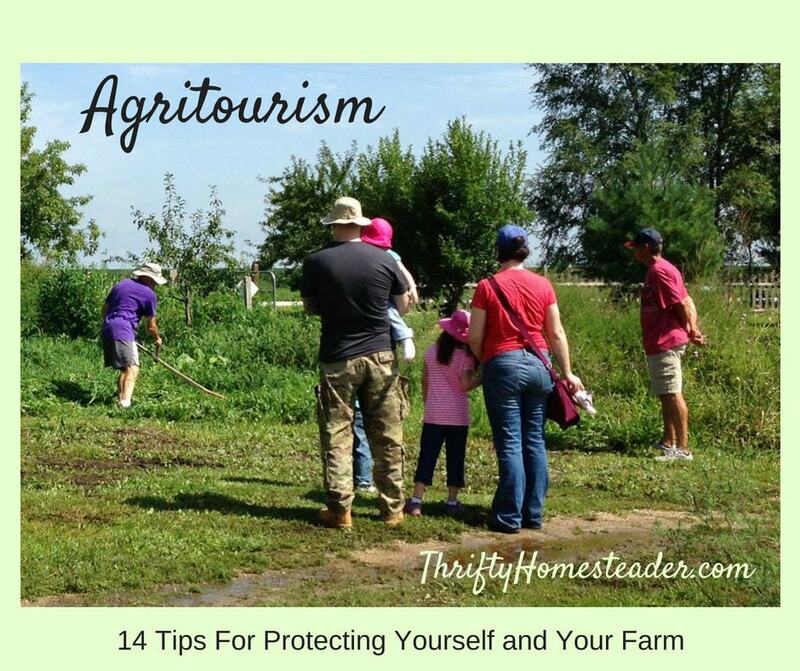 If you are going to be doing agritourism events, you also need to be sure that your insurance will cover you in case a visitor gets sick or injured. Your average farm policy does NOT include this type of coverage, and they may not even be willing to add it any cost. We were actually dropped by a farm insurance company when they discovered that we were doing on-farm events. We did eventually find another company that would cover us, but it took quite awhile to find them. Great post, thanks so much for sharing this as these are things that would not have occured to me given we keep our animals disease free. 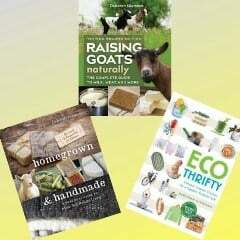 Do you give instructions/rules to people who visit your farm before they enter the goat yard/barn? We had a family who visited us recently to see if they would like to add goats to their homestead. Should I worry about cross contamination of bacteria/disease from muck boots? Their kids kept wanting to chase the goats. Would you have a rule about that? It seems like the best place to observe would be from the other side of the fence instead of in the pasture? I am afraid people would be offended or not understand if we went this far. I definitely tell people what they can and cannot do on my farm. And if someone lets their children chase the goats and mistreat them, then I don’t want to sell goats to them because that’s how they’ll treat them when they get them home. It is also important because of liability issues that you not let them do anything that could be dangerous or result in injury. If someone has no goats, sheep, or cattle (no ruminants), I will let them walk into the pasture because there is no issue with biosecurity. Otherwise we look from the fence. If they want to see a goat, I go get it and bring it to them. Some people provide booties for visitors. When people are looking at kids in the barn, I don’t let them go into the stalls at all. I pick up goats and bring them to the visitors. 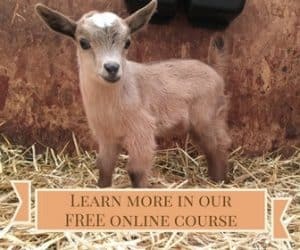 If I wound up in a situation with children chasing goats, I would explain to them that goats are prey animals, and they think you’re going to eat them, which really stresses them out. Most people understand that.